“A right bloody mess“… How that came to be is a funny story in it’s self. 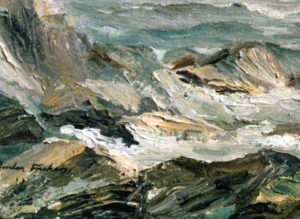 From a study made on location during a strong South Westerly gale. 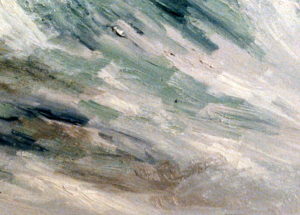 Measuring 50 x 81 cm, [20″ x 32″], long since sold for £500. People usually ask me to paint detail and yet the risks I took that day, the freedom and fluidity of this painting is I feel more representative of my natural character. As I write, on a stormy night in Brittany, as the wind howls and moans in the rain swept darkness outside and my fireplace gently crackles with warmth, while visiting ‘My Maritime Page’ on Facebook [ahh the pleasures of executive displacement activity, thank you for the post Cristina Freitas] I was reminded of van Gogh, by seeing a beautiful study of a gale swept beach, fishing boat coming ashore just as one still sees in many places today on beaches like that of Hastings. That is if you hardy enough to brave the blast. Van Gogh must have painted the scene when he lived and worked out of Pont Avon, near where I am right now. In turn that reminded me of the painting I’m sharing with you here. 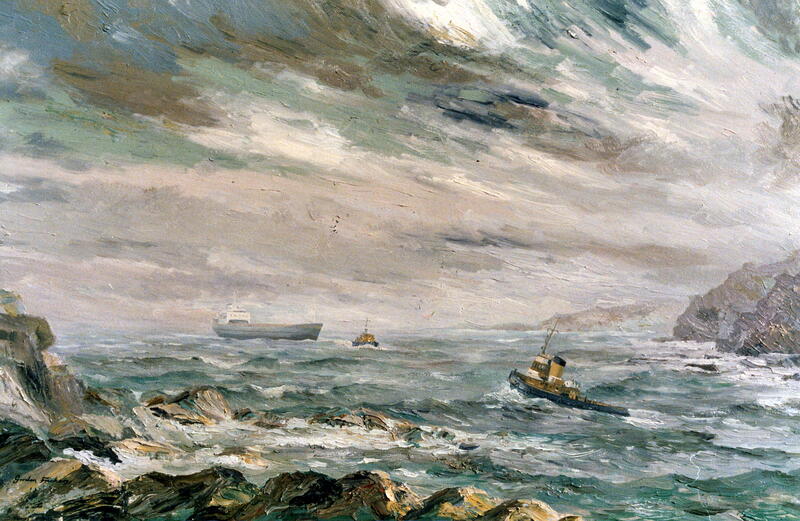 One of my earlier efforts, I produced and sold back in the 1980’s, “Gale off Fowey, shipping movements”. This painting was developed from a location sketch made during the gale, in the days when I lived near Fowey [pronounced Foy as in Toy, hoy or boy]. How that came to be is a funny story in it’s self. Wet and cold as I finished my study, an angler who had been fishing near me came over, looked at my Turneresque sketch and said “you’ve made a right bloody mess of that”. He went home with no fish. 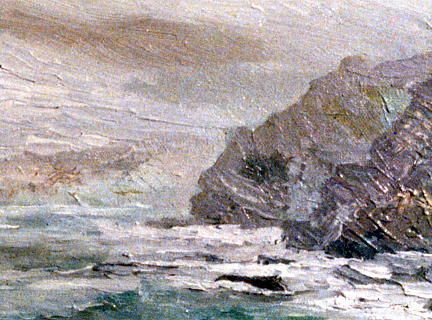 I went home with a study from which I made a painting that I sold for £500… and several other coastal scenes based on the sketch which I still have somewhere here in my store room. I’ll add a more bit of that in the book I’ve been asked to write about my work and life. Of course van Gogh is one of my ‘heroes’ although for me the greatest most pioneering of them all remains J M W Turner who more than any other painter has inspired my life’s calling.